How Many Brides for Fortune? Cover Reveal: Introducing Between Silk and Sand! More eye candy from my collection, featuring the second half of 1813. Soooo pretty! 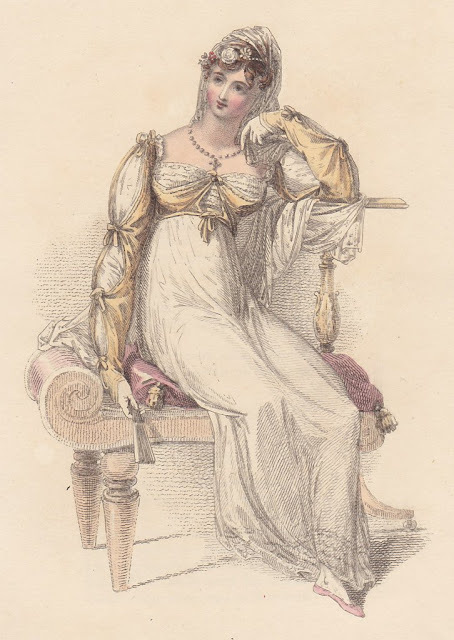 June’s Promenade Dress is “A plain morning gown, of fine cambric or jaconot muslin, with long sleeves, and front cut low at the bosom, appliquéd with lace; a shirt of the same, with a full gathered frill round the throat. A Pomeranian mantle of jonquille satin, trimmed round with a deep white lace. A provincial bonnet, composed of jonquille satin and Chinese cord, confined under the chin, and ornamented on one side with corresponding ribband, a cluster of flowers on the other. A sash of jonquille ribband, tied in front of the waist. Gloves and half-boots of pale lilac or jonquille kid. 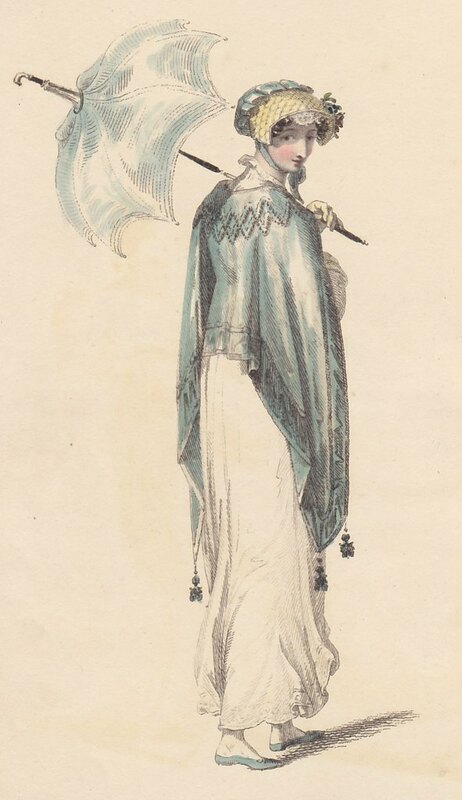 Parasol either white or pale lilac.” However, I confess to being a little perplexed by this description, as the mantle depicted is blue while “jonquille” is yellow. A miscommunication between the magazine and the colorists? Love this Ball Dress, also from June’s issue! “A Grecian round robe, of lilac or apple-blossom crape, worn over a white satin petticoat. 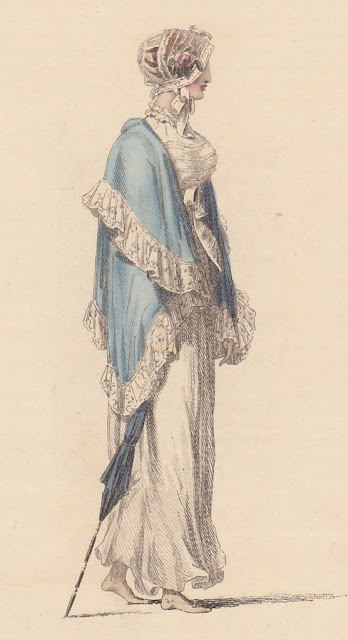 A satin bodice, the colour of the robe, ornamented with white beads and drops, à la militaire; the same continued down the front of the dress; short Circassian sleeves, with similar ornaments; a deep Vandyke trimming of lace, or lilac Angola silk, round the bottom of the robe. An Indian turban, of silver frosted crape, decorated with pearl or white beads; and a bunch of spring flowers beneath, blending with the hair over the left eyebrow. A necklace and locket of large pearl, or the satin bead. Ear-rings and bracelets en suite. White satin slippers, trimmed with a narrow silver fringe. White kid gloves. Fan of ivory, decorated with coloured feathers. Lemon-coloured or white scarf, with rich embroidered ends of gold and coloured silks.” Hmm—another color confusion there, as that is definitely a blue scarf! 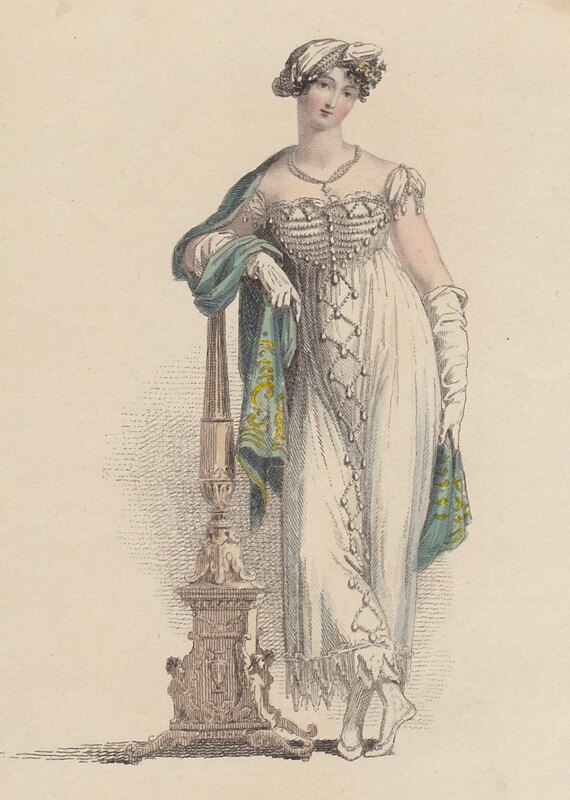 August’s stunning Evening Dress has an interesting description: “THE VITTORIA OR WELLINGTON COSTUME, FOR EVENING DRESS, is composed of Venetian crape, placed over a white satin underdress; a treble row of shell-scalloped lace ornaments the feet, above which is seen a border of variegated laurel. 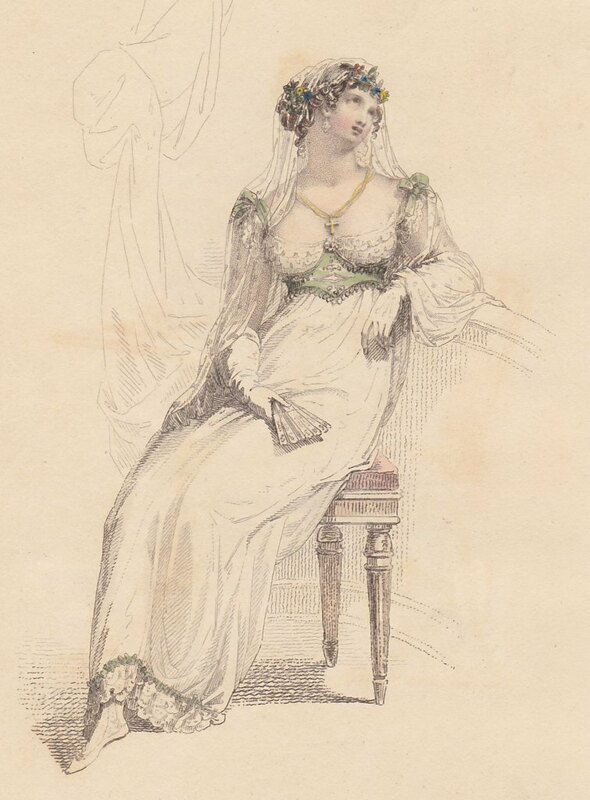 A bodice and Circassian top sleeve of Pomona green satin; the bosom interspersed with shell-scalloped lace, and correspondently ornamented. Shoulders, back, and bosom much exposed. Hair in dishevelled curls, with variegated laurel band in front, and a transparent Brussels veil thrown across the back of the head, and descending irregularly over the back and shoulders. A chain and cross of pale amber earrings, [sic] and bracelets of pearl. Slippers of white satin; gloves of French kid; and fan of carved ivory.” The name of the dress is presumably in honor of Wellington’s June victory over Joseph Bonaparte and Marshal Jourdan in the Battle of Vittoria, a victory that would prove decisive in the Peninsular War and pave the way for the coming invasion of France itself. Also for August (and covering a great deal more than the previous dress) is this Morning or Domestic Costume, consisting of “A petticoat of jaconot or cambric muslin; with a Cossack coat, or three-quartered pelisse, of lemon-coloured sarsnet, with Vandyke Spanish border of a deeper shade. Full sleeves, confined at the waist with a broad elastic gold bracelet; confined, also, at the bottom of the waist, with a ribband en suite. Foundling cap of lace, with full double border in front, confined under the chin with a ribband the colour of the pelisse, and tied on one side; a bunch of variegated carnations placed on the left side. Gloves and Roman slippers of lemon-coloured kid.” I’m not quite sure why the pelisse is not tinted yellow, as her slippers just peeking out from under her gown are. This Evening Costume from September has a very interesting sleeve and bodice treatment, don’t you think? And the bust was definitely emphasized in most of the evening dresses we’ve seen this year. I wonder if the lace veil was pinned into her hair, or left loose so that it could be used as a scarf if the night was chilly? 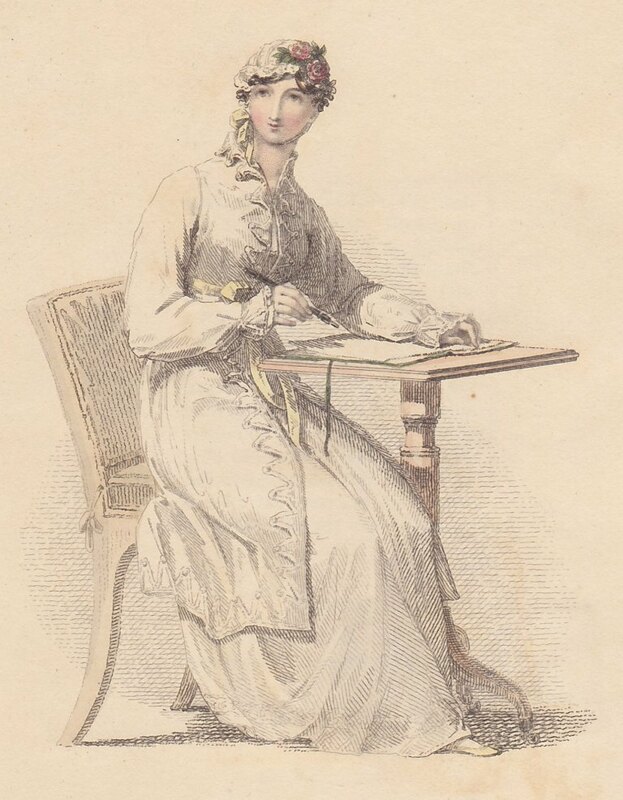 Finishing off 1813 is this Morning Dress from November, “A fine cambric or jaconot muslin round robe, a walking length, with round bosom, a demi height; long sleeves, and shirt, with deep fan frill of vandyke lace: the dress ornamented at the bottom, to correspond. 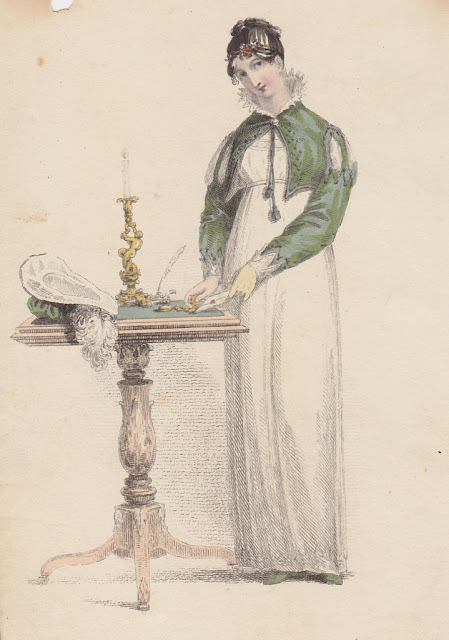 A spencer of Peruvian green velvet or satin, with Spanish slashed sleeves, and deep cuffs of vandyke lace, to correspond with the frill of the shirt, which rises above the spencer, confined at the throat with a pearl or other suitable broach, from which are suspended tassels and cord. The spencer appears unconfined in front, and is lined with white satin, decorated with small cord and buttons. The hair disposed à la Madona, flowing in loose curls on the crown of the head, a small spring of barberry in front. The Swedish slouch hat is worn with this dress in the out-door costume: it is composed of the same material as the spencer, lined with white satin, and ornamented with a curled ostrich feather. Half-boots of velvet, or kid, the colour of the spencer. Gloves, a pale lemon color.” I do wish we could have seen the hat, and gotten the full effect of this charming costume! And that wraps up 1813...what dress do you think you would have liked the best?